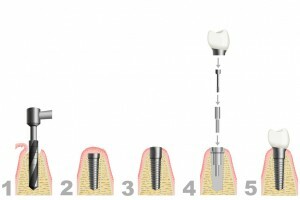 A DENTAL IMPLANT is basically a pure titanium screw that replaces the root of the tooth that we have lost. Because commercially pure titanium is the ideal biocompatible metal; it integrates perfectly with all the mouth tissues, it is stable, does not cause allergic reactions nor does it produce rejections nor adverse reactions. Furthermore, it is a highly resistant material, which means that mechanically it will work to perfection. Treatments with implants have shown results with levels of durability, comfort, aesthetics and predictability, that are highly superior to other treatments for the substitution of natural teeth, to the point that some refer to it as “third dentition”. Statistics indicate a success rate of 95 to 98%, and what started more than 40 years ago as a technique for isolated cases, is today a technique that can be applied to almost any situation. During the 50’s, professor Per Bränemark, from the University of Gotemburg, Sweden, started a revolution in the field of dental implants, with the process called osteointegration, which means the direct connection between the implant and the bone. Since then, scientific and clinical progress has been enormous, and today procedures become simpler and simpler, to the point of enabling us to place an implant right after the extraction of a tooth. Also, with the technique of minimally invasive surgery, we can place an implant without having to open the gum, and the patient can leave the clinic without any stitches, which is the highest level of comfort the patient can have. All these procedures have exacting protocols and are usually carried out with minimum discomfort or none at all. An X-Ray and clinical assessment is carried out in order to determine the quantity and quality of available bone and design a treatment plan for each and every case. This step is essential, because proper planning of the treatment is crucial and unique for each patient. This is the placement of one or more implants through a simple surgical procedure with a local anaesthetic. The procedure is quick and painless, and it is carried out with a technique of minimal incisions, minimally invasive and computer guided, which makes it a lot more comfortable for the patient. Once the surgery is done the patient can go on about its normal activities. This is the stage where all the measurements are taken to manufacture the prosthesis that will restore functionality and aesthetics. In most cases a provisional prosthesis is placed until the definitive one is finished. Regular check ups will help maintain the success of our treatments overtime. We consider that this maintenance stage is essential to conserve the implants in the long run.